Recently I heard Alan November and Will Richardson talk about new technology tools such as flickr, fliction, skype, furl, etc. Yes, they were enthusiastic about them. Yes, they gave an example of how each could be used in education. However, I wonder how widely accepted and used these technologies will be. I thought of a speech I had heard about technology as part of the ecosystem of schools at the Society for Information Technology and Teacher Education 16th Annual Conference. (Can’t remember the speaker’s name but here is an article on it) The speaker argued that technologies would be accepted by educators if they easily fit into the existing ecosytem of the classroom. Those technologies that do not seem like a natural fit or the usual way of doing things will not be accepted. If a technology disrupts the usual way of doing things, then that technology will probably not be accepted. I think of all the technologies that we have introduced into the ecosystem of schools in the last ten years. Two technologies stand out, to me, as being the most easily accepted and commonly used in the classroom. Teachers find that PowerPoint is just like writing notes on the chalkboard except that it is electronic. It is easy for them to accept the idea of PowerPoint and to use it in the classroom (except for needing a projection device! ).Using PowerPoint was an easy adoption. They simply put words on a screen and show it to the students. The other technology that has caught on the most, in my opinion, is the use of United Streaming, a wonderful service of the PBS stations. As soon as teachers see this technology, they instantly “get it,” understand how to use it in the classroom, and begin to use it almost immediately. For teachers this is an online version of the movies or TV shows that they used to show in class. I did hear a Social Studies teacher say that he was glad that they had the whole movie instead of having to show the smaller instructional blocks of the same movie. Just because the technology is easily accepted and is used in the classroom does not mean that it is transforming learning in the classroom. Those easily accepted technologies continue old ways of learning. We need disruptive technologies that shake up the education ecosystem. I just read Robert J Marzano’s Building Background Knowledge for Academic Success: Research on What Works in Schools (ASCD, 2004). I appreciate his blend of theory and practice. One school gives a daily reading tip based on Marzano. Marzano points out the misconceptions that we have about vocabulary learning. He shows that word frequency it not a valid indicator of knowing a word since jellybean occurs very rarely but it is easily recognized by readers. Also, he demonstrates that giving a definition of a word does not lead to knowing what a word means; student have to translate that word into their own meaning. Furthermore, he shows that assuming that students will learn vocabulary by simply reading more is not valid; unless they encounter the same word in different contexts, they will not understand the word. A science friend says that his students have more misconceptions that solid conceptions about science. 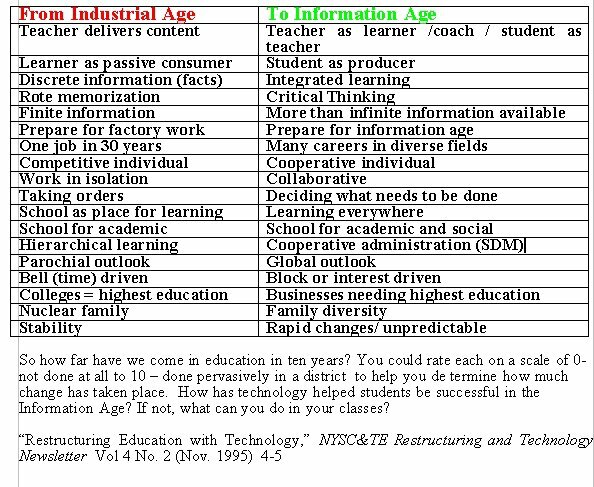 I wonder what misconceptions we have in education and technology? Maybe it is a misconception that we teachers…. Know more about a topic than our students can easily find on the Internet? Can explain things more clearly than a Internet website can? Know more about how to integrate technology into our classes than our students do? Think that the written word is exciting to today’s multimedia students? What other misconceptions do you have to offer? Alan November has a wonderful speech on the need to transform schools. He convincingly cites many business examples of Friedman’s The World is Flat. (MIT has a movie of Thomas L. Friedman giving a speech on his book.) Alan gives examples of how some schools are transforming to meet today’s world. Alan urges all schools to change. I thought of Alan’s speech as I was going through some old books. I found one from 1989, Anne Lewis’ Restructuring American Schools (Arlington, VA: American Association of School Administrators). 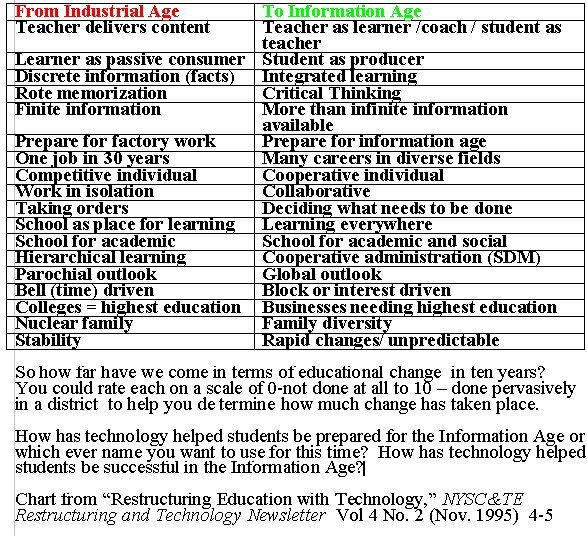 I remembered that the New York State Association for Computers and Technologies in Schools (NYSCATE) had a “Restructuring & Technology Newsletter” for numerous years. Each of these had convincing arguments as to why and how schools should change. 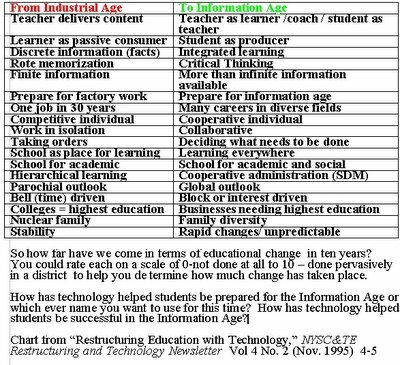 As I began to think about the 1989 restructuring movement, I thought about the most famous example of why schools should change. A wonderful fable called “The Saber-Tooth Curriculum” by J. Abner Peddiwell (a.k.a Benjamin Bloom) tells about a curriculum that no longer served the needs of the school; tiger-scaring was a critical element of the curriculum even though there were no longer tigers to scare. His powerful 1939 tale could be told today. Unfortunately, this witty tale did not cause schools to change their curriculums. Are schools finally ready to transform? Is technology going to be the catalyst or tipping point to make it happen? Do we show our colleagues that technology allows their students to work with students in other parts of the world just as easily as working with a class next door? Social Studies students can email paragraphs on what freedom means to students in other countries and those students can react. Science students can videoconference about erosion in the local geography of a place thousands of miles away. English students can use Skype to talk with students in other countries about a common theme such as discrimination in The Chosen. Math students can create web pages comparing local prices of common foods with students in other countries. Transforming Schools…Hopefully, it will happen through technology. When I started teaching Spanish in 1968, I used transparency pictures for class writing, conversations, oral comprehension and quizzes on a daily basis. (The overhead was a new technology back then!) Yes, it was a big pain to find the right picture from magazines or newspaper and then to make transparencies of the pictures. Yes, sometimes the transparencies melted (cheap transparencies and hot overhead machines). Also, I used a slide projector to show cultural pictures that I had taken in Spanish speaking countries. In 1975, I wrote an article (“Using Visual Material in the Foreign Language Classroom” Learning Resources, Vol 2-5 ,Feb. 1975, 9-13) on improving students’ language and cultural skills through fifty uses of visuals in the Foreign Language classroom. In addition, I mailed (not emailed) pictures of our area to students in Spanish speaking countries who asked us questions about our area. I made handouts of pictures for students to use in a variety of group activities within the classroom. The basic educational concept has not changed throughout the years. Many students are visual learners and they react well to visual images. Can you say Millenial students? The students are engaged when visuals are used. So, what would I like from Fliction? I want it to do more than I could do with the overhead, slides, handouts or mailing pictures. I want a more powerful learning technology. So far, based on the two presentations I have seen on Fliction, I have only seen one story attached to one specific picture and one comment on that writing. What about multiple stories to one picture? What about “continue my story” approach?What about two contrasting pictures to create higher level learning about a topic? What about a series of pictures showing a local community or topic? What about multiple comments to the multiple stories? What about a dialogue between the picture presenter and the story writer? What about writers role playing different people in the picture and having a conversation. 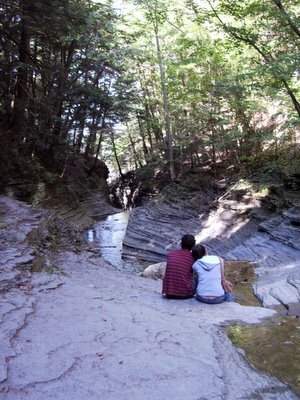 For example, in above picture which I took are the two people happy or sad? What are they saying to each other? What are they saying about their location? How might the location represent their relationship? Visuals are rich learning resources. I want students to have rich responses to them and to be able to respond to the pictures easily. I’ll wait for a better developed learning-embedded technology image than Fliction. I’ll wait for a brighter use of technology to help students express their in depth ideas.